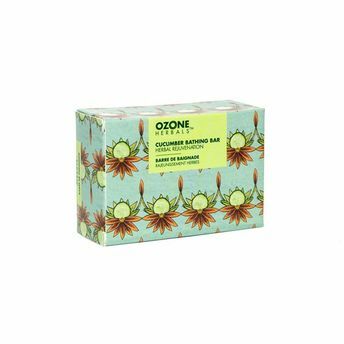 Ozone Herbals Cucumber Bathing Bar rich in ascorbic acid, refines skin, minimizes enlarged pores to improve skin texture with its astringent action. It helps to remove excessive oil and dirt restoring skin's natural pH to revitalize and refresh skin and improving uneven skin tones. This glycerin soap traps moisture to deeply condition skin and restore its moisture balance leaving skin cool, clean, clear and smooth.